John Adelmann was born in Massachusetts and raised in Norwood, where his father Frederick worked as the assistant post office manager. Little is known about his early life aside from his high school education; Adelmann was out of school by the time he enlisted in the Marine Corps – the day after his twentieth birthday. Somewhat fittingly, his first assignment after boot camp was to serve as a mail orderly at the Parris Island recruit depot. After a brief stint as a messman at the Reserve Officer training facility at MCB Quantico, Private Adelmann received orders for the Fleet Marine Force and traveled across the country to sunny California. He arrived at the barracks of Company A, First Battalion, 24th Marines on September 8, 1943; following four more months of training, Adelmann was promoted to Private First Class and served as a rifleman during the battle of Namur. In the spring of 1944, Adelmann re-qualified with the BAR; he landed on Saipan on June 15 and fought through the first difficult week of the battle. After his company walked into a Japanese ambush on June 22, Adelmann was carried from the field with puncture wounds in his right leg and shrapnel embedded in his left arm. The USS Monrovia brought him back to Hawaii, where he was admitted to the Naval Hospital in Aiea Heights. 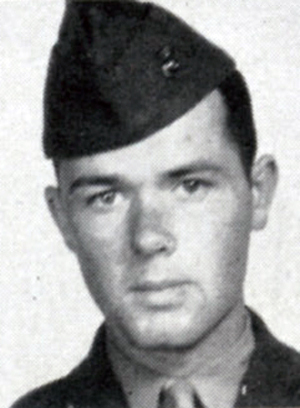 Adelmann reported back to Able Company in November, 1944 and was immediately swept up in the battalion’s frenetic training schedule. His veteran status earned him a place on the promotion list, and he became Corporal Adelmann on December 13. However, he would not get the chance to exercise his new authority in combat. When the USS Hendry stopped over at Eniwetok Atoll en route to the next objective, Adelmann was carried off the ship and into the base hospital. Some illness or injury had laid him low – and spared him from the bloodbath of Iwo Jima. Following this second hospitalization, Adelmann returned to Maui; he was taken up on the company rolls again effective April 13, 1945. He would spend the summer training at Camp Maui, first with Company A and then with Battalion Headquarters, until the war ended. After his discharge, Adelmann returned to Norwood, where he married Catherine Campbell. He died in 2000, and is buried in Highland Cemetery.